When searching for male birthday gift ideas - beer tops the list. you know . . . anything beer. 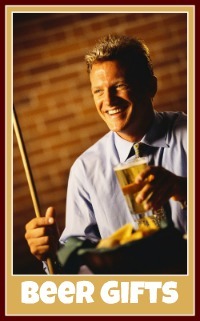 Are you shopping for a real man who probably wouldn't see the merit in a gift basket? Is he a "man's man"? I've got some good ideas for you! Say it like a chant and you'll choose the right gift! Does he appreciate good beer? Then he'll like this chest full! This manly gift includes beer from all over the world. He'll be familiar with several of these brews. But, a few will be a new surprise! It's also packed with salty and sweet treats to go along with his brew. This is a great gift to give in person, or have it shipped if you're going to miss his birthday celebration. The other thing that's really good about this gift is that it's perfect anytime of year. Because of that, it tops the birthday gift ideas list. These cool mugs can be personalized. Plus he'll love the way these freezer beer mugs keep his favorite beer club beverage super cold! He can also use one of these mugs for a milk shake or root beer. Funny beer pictures go on anything. Whether they're on his iPhone, shirt or wall - he'll get a kick out of these male birthday gift ideas. If you'd prefer to give him a gag gift, I found these silly beer themed gifts. This type of gift is really fun to give. And, he may get more use out of it than you originally thought. What about beer candy or beer nuts? I've even found some. 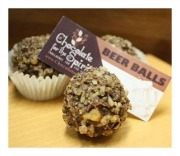 . .
believe it or not: beer balls. Sure to be a birthday favorite! My Dad would have absolutely loved these beer nuts! Whenever we went to the mall...his first stop would be a little kiosk called the nut hut. Always made me laugh! I loved shopping with him!